She said acknowledgment that under the regime’s supreme leader Ali Khamenei, the regime “oppresses its people, abuses their rights” and “exports violence, destabilizes its neighbors, and sponsors terrorism abroad,” is a recognition of the illegitimacy of the Iranian regime. Maryam Rajavi said previous U.S. administrations’ policies of turning a blind eye on flagrant human rights violations in Iran, the regime’s deadly meddling in the region and concessions made to it in the course of the JCPOA have been disastrous, and for which the people of Iran and region have paid heavily. The most destructive part of this policy has been the terrorist designation of the legitimate opposition to the regime, the People’s Mojahedin Organization of Iran (PMOI/MEK), for 15 years, at the behest of the religious dictatorship ruling Iran. The NCRI President elect added, a firm policy is long overdue. However, the ultimate solution is the overthrow of the regime and establishment of freedom and democracy in Iran by the Iranian people and Resistance. For years, a policy of appeasement has acted as the main impediment to change in Iran. It is time that the international community recognizes the aspirations of the Iranian people and stands with the people of Iran and their legitimate right for regime change. 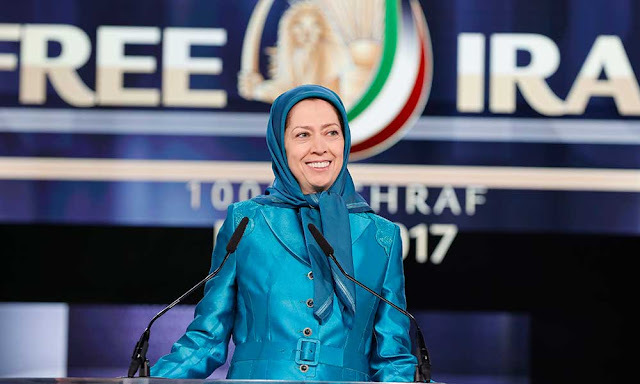 Mrs. Rajavi underscored, it is imperative that the National Council of Resistance of Iran be recognized as the sole democratic alternative to the terrorist, religious dictatorship ruling Iran to rectify the past disastrous policy. Maryam Rajavi also welcomed the designation of the IRGC as a terrorist entity under Executive Order 13224 and described it as an inevitable, necessary step for regional and global peace and security. The IRGC is the prime means of suppression, execution, and torture in Iran, spreading terrorism throughout the world, war mongering and massacre in the region, the drive for acquiring nuclear weapons, and the increase in the proliferation of ballistic missiles. If the IRGC had been recognized as a terrorist entity earlier and dealt with accordingly, the current situation in the region in general, and Iraq, Syria, Lebanon, Yemen, and Afghanistan in particular, would have been totally different. It is time to immediately place under sanction all the individuals, entities, institutions, and companies affiliated with the IRGC and their trade counterparts. The IRGC and its affiliates control the major portion of the Iranian economy and directly reap the benefits of Iran’s economic relations. Those funds are used for domestic suppression, export of terrorism and fundamentalism and belligerence in the region and the world. Maryam Rajavi added: All the signs, including intensification of the regime’s internal crisis, continuous deterioration of the economic situation and expansion of anti-regime protests throughout the country, indicate that the regime has reached its final phase; its hollow bluster regarding the new U.S. policy reflects its extreme anxiety regarding the end of the appeasement era. • The dossier of the Iranian regime’s crimes, particularly the massacre of 30,000 political prisoners in 1988, must be referred to the UN Security Council, and the regime’s leaders and perpetrators of these crimes must be brought to justice. • The clerical regime, the Islamic Revolutionary Guard Corps (IRGC) and its mercenary militias must be expelled from Iraq, Syria, Yemen, Afghanistan, and Lebanon; and prevented from shipping arms and dispatching forces to these countries. • In view of its support for terrorism and continued human rights abuses, the Iranian regime must be denied access to international banking systems. • And, the previous UN Security Council resolutions on the clerical regime’s nuclear weapons projects, ban on nuclear enrichment, as well as free and unconditional inspections of military and non-military centers must be implemented.